Year in review: 2014 | Thinking is the enemy. It’s that time of year when we like to look back on our accomplishments (or lack thereof) before setting goals for the future. Back in January I posted some writing goals for the year, so let’s take stock and see how I did. Update blog weekly. I started off strong, but have been lagging of late. Still, I’ll likely end up with about 50 posts for this year, so I’m counting this as a win. I am planning to change my blogging approach in 2015 — more on that next month. Go to a conference. I attended the SCBWI Carolinas fall conference in September. Take a class. Done — a one-day seminar with middle-grade writer John Bemis. Finish draft of WIP. Hooray! This was a big one. Apply for 2015 writing residency. Not done yet, but the application is simple, and I’m planning to knock it out this weekend. Revise draft of WIP. My original goal was to finish before the end of the year. I’m not yet halfway there, but I’ve made a good start. Send out queries for WIP. Needless to say, not going to happen until this revision is done. Or maybe the revision after that. Develop characters and plot for new book. I’ve been making notes for two books — one that I know would be fun to write, and another one I feel like I need to write. I need to commit to one or the other. Write 1,500 words/week. This was all well and good while I was finishing my draft, but I’m focusing on revision now. Some of that involves drafts for new scenes. I need to do some thinking about how I can write more (say, for a new book) and still get the revision work done. So that’s it. Next month I’ll post some new goals for 2015. Until then, allow me to wish you abundant peace in the new year. 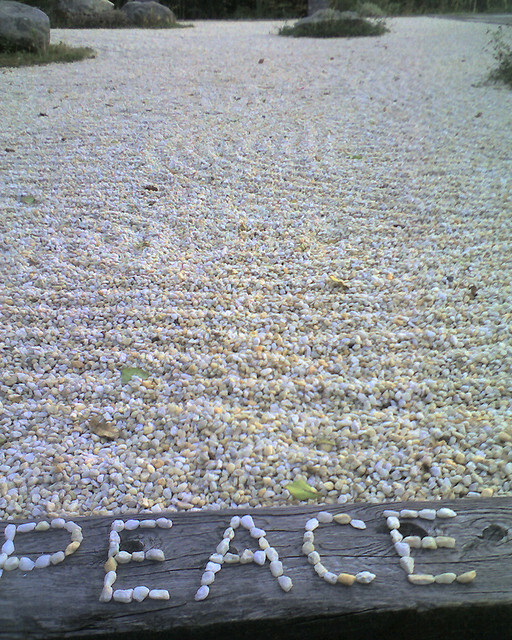 Photo credit: PEACE by Baer Tierkel under CC BY 2.0. This entry was posted in Writing and tagged goals, revision, SCBWI, writing, year in review. Bookmark the permalink.